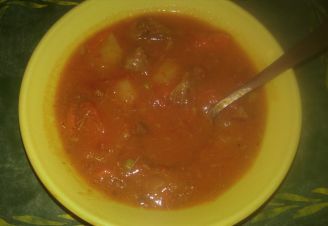 Beef and Vegetable Soup – Create, Make & Bake! My first soup containing meat. Surprisingly, nobody liked it that much. I don’t think that there should have been that much tomato put in, it sorta masked the beef. It’s also a FODMAP recipe. 1. Cut the fat off of the meat bones, melt a chunk of the fat in a soup pan. Cut the meat into chunks. 2. In a bowl, mix together the salt, pepper and paprika. Put the meat into the bowl and make sure they are well covered. 3. Cook the meat (including the bones) in the fat until browned, add the carrot and water. Cover and let simmer for 2 hours. 4. Add the rest of the ingredients and simmer until the potatoes are completely cooked. 25-30 minutes. Add more seasoning if necessary. Take out the bones before serving.